You might say it was Paul Bettencourt’s moment. On a brisk January morning, just weeks into the legislative session, the Republican state senator from Houston arrived at a press conference to help unveil one of the governor’s top priorities, a sprawling property tax proposal that would change the appraisal process and impose a new election trigger allowing voters to approve major increases in tax levy. Senate Bill 2 had his name on it, and it was headed, the next week, for the committee he chairs. Of the five Republican men at the table — Gov. Greg Abbott, Lt. Gov. Dan Patrick, House Speaker Dennis Bonnen, and state Rep. Dustin Burrows, Bettencourt’s House counterpart — Bettencourt looked the least like a politician. The other four wore crisp white shirts — two red ties, two green — and Bettencourt was in a blue sweater. All five men looked pleased. But Bettencourt was positively jolly. And why wouldn’t he be? It’s been more than a decade since Bettencourt came to the Capitol as a lowly local official, fighting to be heard as he agitated for property tax reform. Now he was a major player at the table, feet from the governor, laying out the bill that on that January morning seemed to have everything — and everyone — it would need to become law. Burrows, the House Ways and Means chairman, spoke first, and he took less than a minute — throwing a joke to the governor (the cameras were on Burrows, but Bettencourt’s laugh stole the moment), praising the legislation, then promising to listen to his 149 House colleagues. When it was his turn, Bettencourt went some four times as long, citing a bevy of statistics, rattling off the names of his co-authors, nodding to gentrification, barking out his notorious laugh — and joking, characteristically, that the chambers should pass a symbolic resolution renaming the proposal to House and Senate Bill 2.5 after the 2.5 percent election trigger it proposed. He also acknowledged the size of the moment. “We did start a long time ago, 15 years ago as citizens, and we’re gonna finish it for the citizens, this session, this year, because they’re crying out for property tax relief,” Bettencourt said. For Bettencourt — a property tax consultant who says his work at the part-time Texas Legislature is not a conflict of interest but rather a productive public use of his expertise — that fight is long and personal. He’s been steeped in this issue for two decades. He’s been the “Tax Man” on a weekly radio show for years. It’s why he’s courting even unlikely Democratic votes and quibbling with media coverage that casts doubt on his bill’s future. His time has come. He doesn’t want to screw it up. For two months after that kumbaya-soundtracked press conference, the bill has languished, passing out of Bettencourt’s committee but not coming to the Senate floor as he works behind the scenes to recruit support. Local officials came out against it in force. The House overhauled its once-identical bill, a version that will have to be reconciled with Bettencourt’s pitch. And Bettencourt, its author and its shepherd, waited to prove his mettle. This week, for the first time, the bill was put on the full Senate’s agenda. Was that a sign that the logjam has been broken, observers wondered? Or was the bill — still rumored to be far from passage in the upper chamber — just rotting in a different place? The bill didn’t come up before the Senate adjourned for the weekend. If Texas’ property tax system is to be overhauled, this is the year. Reform has buy-in from voters and public backing from every relevant state leader. It’s a top priority in both chambers. And Texas Republicans, who after last fall’s elections retain complete power over state government but with a thinner mandate than they’ve had in decades, know that if they don’t deliver this year, they may not be back to give it another try. The moment hailed as the catalyst of Patrick’s political career is, in a different way, Bettencourt’s as well. It’s a 2003 Capitol committee hearing squarely lodged in the Dan Patrick lore. The subject, of course, was property taxes. Bettencourt, then well into his 10-year tenure as Harris County tax assessor-collector, had helped organize busloads of Houston homeowners to speak at the Capitol. By mid-afternoon, no one in their group had been called to testify. Bettencourt sat toward the front of the room, listening to “one lobbyist after the next.” If at 3 p.m. no one had yet been called, he decided, he was going to speak up. Since they met in Houston’s Republican political circles some two decades ago, Bettencourt and Patrick have become allies and friends — working together on tax reform and on the radio network Patrick owns, which hosts Bettencourt’s show every Friday afternoon. From the agitators in the audience at the hearing, they have ascended; now they sit at the dais of the chamber and the head of the committee room, gavels in their fists. They’ve done that together, though Patrick remains the louder of the two, the clarion call from the back of the committee room. 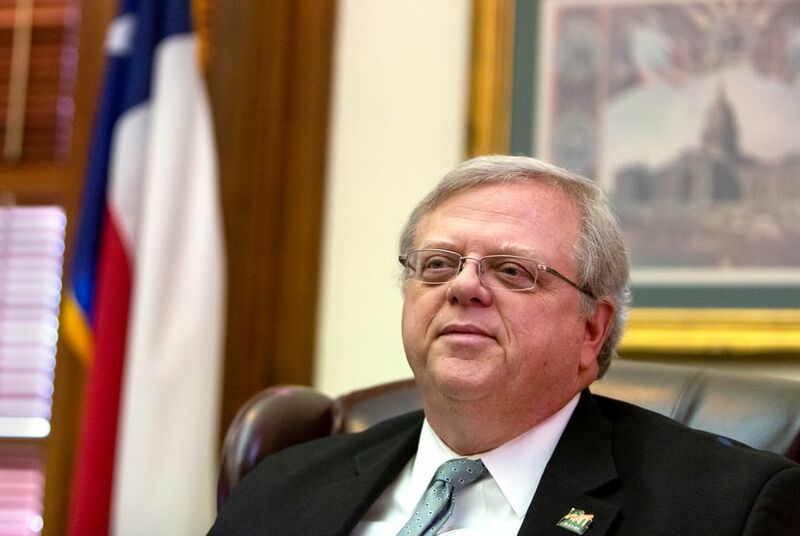 After Patrick had served several terms in the Texas Senate, as he began to mull a run for lieutenant governor, he called Bettencourt: Might the “Tax Man” be interested in running for the Legislature? Matter of fact, he would. Since joining the Senate — as it became Patrick’s Senate — in 2015, Bettencourt has been a loyal foot soldier for the lieutenant governor. He’s been rewarded for that loyalty. During his first year in the Legislature, Bettencourt was named chairman of the Select Committee on Property Tax Reform and Relief — a rare leadership role for a freshman and one he earned again in 2017. Since 2016, he’s served as the Senate GOP caucus chair, wrangling members on tough votes and working on what he calls “messaging” for party priorities. For Bettencourt, the policy comes with a side dish: “The humor is part of it,” he said. 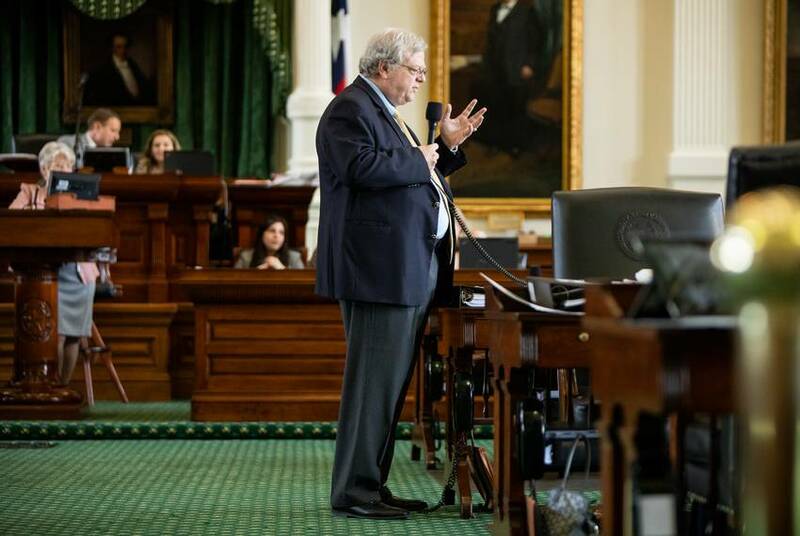 State Sen. Paul Bettencourt, a Houston Republican who says "humor is part of" his legislative approach, cracks a joke on the Senate floor on April 4, 2019. 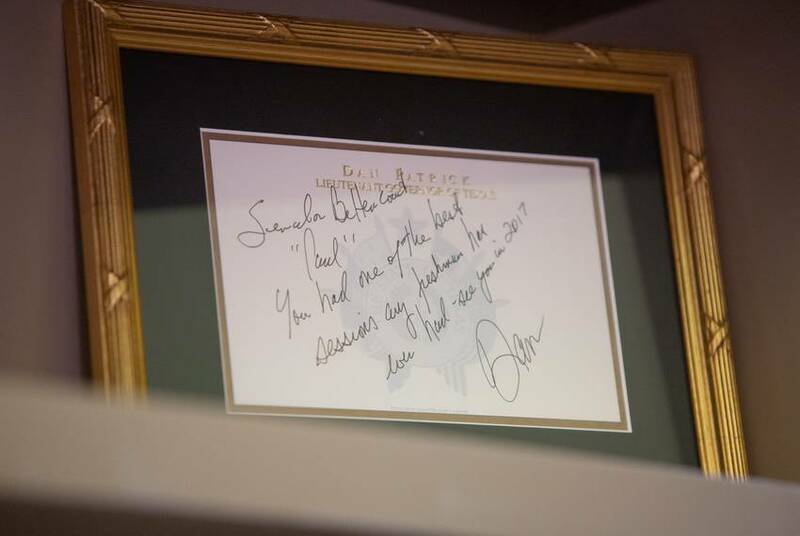 Bettencourt is the owner of the loudest laugh in the Texas Capitol. It lands somewhere between a jolly chortle and a barked guffaw, a “ho ho ho” or a “nyuck nyuck nyuck” that unmistakably signals his presence. Between those quips, Bettencourt is, Republican colleagues agree, the “numbers guy” — which depending on interpretation can mean the fast-talking salesman rattling off persuasive stats or the dorky friend taking care of the whole team’s math homework. This time, again, he’s counting on Paul on property taxes. Bettencourt was a numbers guy, and a conservative, before he became the “Tax Man.” A proud Texas A&M Aggie with an industrial distribution degree, Bettencourt has been immersed in politics since at least his days at Houston’s Memorial High School, when he and Steve Munisteri (who would go on to chair the state Republican party and work in the Trump White House) used to hold hallway debates with classmates who backed George McGovern in his 1972 bid to unseat Richard Nixon. He wasn't yet old enough to vote. Bettencourt became a local political fixture in the then-solid red of Houston; he has been a precinct chair (he worked in George and Barbara Bush’s precinct, and ran into them at the polls, maybe, sometimes, not totally by coincidence), as well as treasurer of the county GOP and then the state GOP. In 1998, the Harris County tax assessor-collector died, and the local party drafted him. When he spoke on local radio show, the host played the Beatles’ “Taxman.” He was christened. Bettencourt’s tax ideas ran for the Legislature before he did. Munisteri recalled that when he ran for the state House in 2002, he did so on Bettencourt’s tax plan. Munisteri ultimately lost in a five-way Republican primary. After 10 years as Harris County’s tax chief, Bettencourt was ready to move on to something new. As a property tax consultant, Bettencourt makes money by helping commercial and residential property owners fight their tax appraisal values. Changing state law, he said, is his way of extending that help to the rest of the state’s millions of homeowners. But ethics experts look askance at a system in which the man writing the state’s property tax laws makes his livelihood on them, too. In 2017, when Bettencourt championed but failed to push through a similar property tax proposal — a different Senate Bill 2 — the Houston Chronicle’s editorial board opined that the bill “wouldn't do anything to fix our state's reliance on property taxes,” but could help Bettencourt’s business. 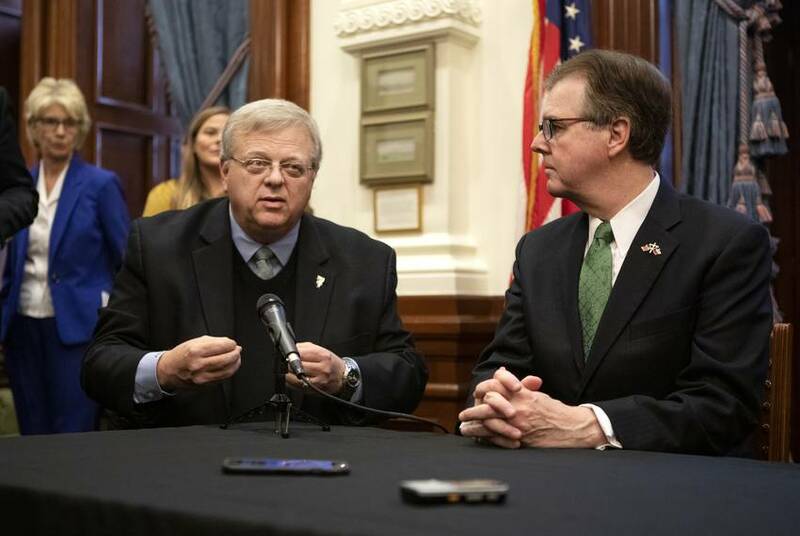 Conflicts of interest are hardly rare in Texas’ citizen Legislature, where lawyers chair committees governing the judiciary and doctors author tort reform legislation. But ethics experts raised their eyebrows when Bettencourt was handed the plum position of chair by his longtime friend and ally — especially given that it was handled differently this year in the House. State Rep. Drew Springer, who works at Ryan LLC, a firm that helps large corporations secure tax breaks, was not shy about his wish to continue serving on the House’s tax-writing Ways and Means Committee, perhaps even as chairman. But Bonnen, the speaker, took Springer off the committee. Burrows, who was named to chair the House’s committee, works as an attorney. A homeowner’s tax bill is determined by the local tax rates (set by cities, counties, school districts and other local taxing entities) and the home's appraisal value. Many experts say the reason property tax bills are going up is a marked increase in appraisal values, particularly in growing and gentrifying cities like Austin and Houston. Bettencourt’s bill would slow the growth of tax bills by focusing on the total tax levy; under his proposal, if taxing districts want to increase their total tax revenue by more than 2.5 percent in a given year (not counting new growth in the area), local officials have to put it to a vote. Of course, consultant Bettencourt’s efficacy is pretty high on the appraisal value, too. Property tax consultants can help their clients fight for lower appraisal values. But they can’t influence the rates that local taxing entities set — unless, of course, they are state lawmakers. Some influential lawmakers have, this year and in the past, proposed reforming property taxes by capping the rise of appraisal values. That approach would likely make Bettencourt’s services as a consultant less necessary. Sen. Kel Seliger, R-Amarillo, has authored a tax bill that would cap appraisal rates. It’s been referred to Bettencourt’s committee, but not scheduled for debate. “We have not had in-depth discussion on [it]," Seliger said, "and that would certainly be welcome." Bettencourt said he has looked at “every tool in the toolkit” to stem property taxes, and focusing on the rollback rate is the best way to control local spending. He also made clear that he does not consider his private business a conflict of interest with his leadership role on state tax policy. After all, doesn’t it pay to have an expert writing the laws? And if his law succeeds as he hopes, he emphasized, it would mean less money flowing through his consultancy. 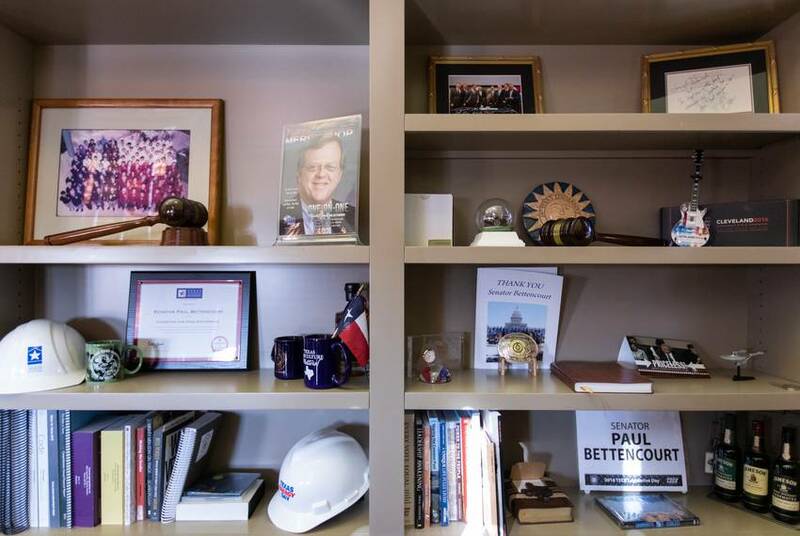 Between Bettencourt and his bill’s place in state law stand the hostile opposition of local officials; a Senate chamber of Democrats and even some Republicans who have yet to sign on publicly; and a Texas House with its own ideas of how to reform the system. With more than half the session gone, it’s not clear Bettencourt has cleared even the first hurdle: the obstinate opposition of municipal leaders whose criticisms influence the senators Bettencourt needs to move his bill. That was on clear display in February when he convened his committee for its first hearing. Gavel in hand — and, later, “2.5” button on his lapel — he kicked off the hearing with humor: Property tax increases are “a real simple equation that an Aggie can explain with two hands,” he said, making line graphs of his limbs. But he also gave local officials something of a warning. “When you testify today, know that we’ve got the numbers, and we can pull up anybody’s taxing jurisdiction and look at your actual record,” Bettencourt said. Bettencourt quibbles with that characterization. He emphasized that the committee stayed late into the night — the hearing ultimately ran more than 12 hours — to hear from everyone who wished to testify. He had his staff distribute a five-page transcript of one tense exchange to several Capitol news outlets. Data is the only way to start important public policy conversations, Bettencourt said. But some of the chairman’s critics say he doesn’t always hold himself to the same high standard. The senator defended the committee’s presentation: “Any way you slice the data,” he said, property taxes are rising faster than homeowners can afford. Critics said that the tense February hearing this year was another example of the Senate GOP’s “numbers guy” spinning the figures in a way that makes his point, but isn’t entirely honest. When Bettencourt questioned Jeff Coyle, an official with the city of San Antonio, for example, he slammed the city for a 41 percent tax levy increase over a period of four years. “Taxpayers can’t pay for it!” Bettencourt railed at the hearing. Ultimately, Bettencourt passed his bill out of committee with no opposition; the committee’s sole Democrat voted present. But since then, it’s stalled. More than two months after they sat side by side to roll out identical bills, a rift has begun to show between the two tax chairmen. Last week, Bettencourt posted to Facebook a Houston Chronicle story in which he was quoted seeming to criticize the House for moving to exempt school districts from its property tax proposal. “School districts on average account for more than half of your property tax bill and must be included as part of any property tax reform and relief plan,” Bettencourt wrote. The flap seems to have died down as quickly as it flared, and both the comment and the original post have been deleted. Burrows declined to comment for this story. Bettencourt has already suggested he’s willing to make concessions; the rollback rate, he and the lieutenant governor have said, may well land above the 2.5 percent threshold they originally pitched. Still, the proposal has yet to come to the Senate floor for a vote. Even as it sits eligible to come to the Senate floor, critics and political insiders speculate that the bill doesn’t have the 19 votes it would need to do so. Senate leadership has been working hard behind the scenes to recruit support. Without Seliger, Bettencourt would need at least one Democrat — or, perhaps, a complicated rules maneuver from his friend on the dais — to get his pitch out of the upper chamber. Tuesday’s hours-long floor debate makes bipartisan support for the bill seem less plausible — and makes the odds he gets the bill out of his chamber yet steeper. But even when that peak is summitted, a mountain range sits on the other side: Bettencourt still has to to reconcile his version with the overhaul Burrows’ committee has put forward; then both chairmen will have to turn back to their chambers and ask, again, for their approval. “I’m never gonna stop on this,” he said.